Michael Ondaatje, author of “The English Patient,” was born in Sri Lanka (then known as Ceylon). In 1954, at the age of 11, he left for England and in 1962 he moved to Canada. Only as an adult did Ondaatje go back to visit the island of his birth, which he called the “pendant off the ear of India.” While there, he investigated his family history through the places and people still there. This is his account of these visits. 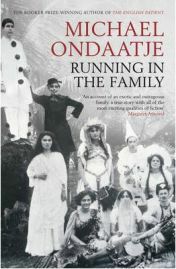 In fact, if the stories that Michael Ondaatje tells in Running in the Family weren’t true, this would have been an amazingly beautiful book of fiction. As it is, what Ondaatje gives us here is an incredibly evocative and poetic memoire that stirs the soul and enwraps its readers at every turn. Do we learn about his family? Yes, but with wit and humor and the idiosyncrasies behind the people that make them so uniquely loveable (and sometimes despicable). Do we hear about the places where his people lived and worked? Yes, but with the strange and amazing ghosts and mysteries together with the tropical flora and fauna that makes them come alive in all their exotic ecstasy and danger. Is there history of the island included? Yes, but only where events either are vital to or can enhance the stories about all these fascinating people and places. But more than anything, this is absolutely exquisitely written. Every page is as rich and as smooth as silky cream. Every scene is a vibrant painting evoking pictures that come alive from the words. Every story is told with both the wisdom of hindsight and the twinkle of a memory that might just be ever so slightly exaggerated to make the listener react with anything from a small giggle to a huge guffaw. And while all this might sound like sensory overload, I can once again assure you that Ondaatje has paced this to absolute perfection so that we feel he is taking us on a trip that winds around from the shore through the plains to the mountains and back again – with ample time for both the journey and to reflect on all that we’ve seen. There’s no getting around it, I’m totally and hopelessly in love with this book. Every aspect of it is pure perfection and I cannot recommend it more. I’d give it six stars out of five if I could (and will be eternally grateful to my darling husband for digging around in my wish-list and buying it for me as a birthday present)! No Comments on "Running in the Family"